The organisation of the Orthodox Church worldwide has profoundly changed during the 20th century due to the restoration or the proclamation of several autocephalous local Churches. Indeed, some local Churches, that had in the past centuries an honorific patriarchal status because their country had been in the past an independent kingdom from the Byzantine Empire, were restored as autocephalous and patriarchal Churches by the Ecumenical Patriarchate, but always in the limits of concrete state implying concrete geographical borders. This was the case of the Churches of Serbia (1920), Romania (1885 for the restoration of autocephaly, 1925 for the restoration of the patriarchate), Bulgaria (1953) and Georgia (1990). In each of these cases, the major reason for the restoration of their autocephaly and of their patriarchal status was the independence of their state either from the Ottoman empire (in the case of the first three) or from the Russian empire (for the Church of Georgia, in 1917). Although the process of the canonical proclamation of the restoration of their autocephaly by the Ecumenical Patriarchate took in certain cases a long period — in the case of the Church of Georgia, although the restoration of autocephaly was recognised 26 years later by the Church of Russia (in 1943), when both Georgia and Russia were under the Soviet Regime, it took 73 years to be canonically proclaimed by the Ecumenical Patriarchate (in 1990) —, the pleroma of the Orthodox Church did not have any major problem to accept and approve the restoration of the autocephaly and of the patriarchal status of these local Churches since they were considered in high esteem and respected as such by the conscience of the Orthodox Church. Besides the restoration of these four patriarchal Churches, the Orthodox Church proclaimed autocephaly to three additional local Churches: the Church of Poland, the Church of Albania and the Church of Czechoslovakia. The reason for proclaiming the autocephaly of the Church of Poland was the request addressed to the Ecumenical Patriarchate by the Polish Republic between the proclamation of its independence in 1918 and 1923. The Polish State, which recovered its eastern territories from the Russian Empire, was favourable to the existence on its territory of an Orthodox Church on the condition that she would not serve and not be controlled by the Russian Empire. For this reason, the Polish State addressed a request to the Ecumenical Patriarchate to grant autocephaly to the Orthodox Church of Poland. In response, the Ecumenical Patriarchate proclaimed autocephaly of the Church of Poland in 1924, taking as a basis that the Church of Poland consisted of eparchies which used to belong to the Metropolis of Kiev and were in the past under the direct canonical jurisdiction of the Ecumenical Patriarchate until 1686. Three Orthodox bishops in Poland did not agree with this new status and had therefore to leave Poland. The Church of Russia also disagreed with this proclamation and therefore did not recognised the autocephalous status of the Church of Poland until 1948, when she proclaimed by herself autocephaly of the Church of Poland, at a time when Poland happened to find itself behind the iron curtain. The Church of Albania had been auto-declared by the independent Albanian State in 1922 by an ecclesiastical-national congress. The reason was a growing national consciousness, following the independence of their country, among the Orthodox Albanians, who were Albanian-speaking Greeks, which led them to search freedom from Greek influence and to use Albanian as their liturgical language. 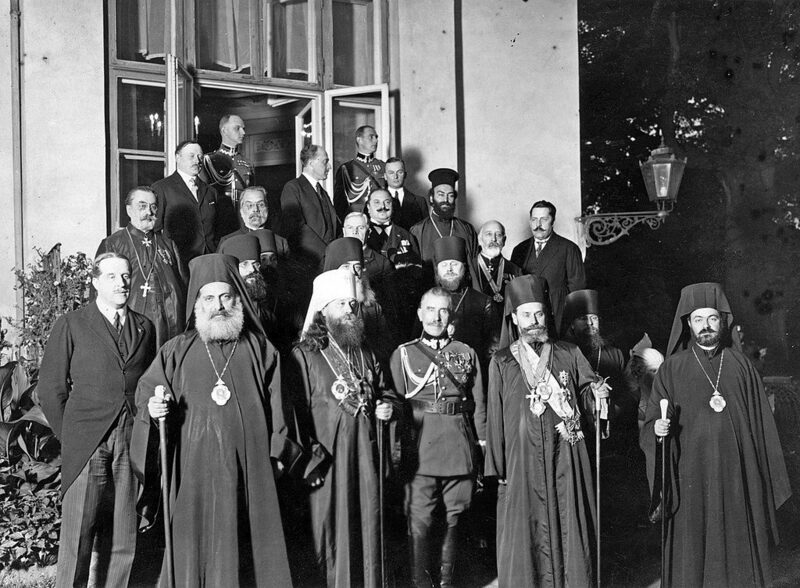 For obvious reasons, the Ecumenical Patriarchate at the beginning was reluctant to give them the status of autocephaly and accepted to grant a status of autonomy on specific conditions that were not accepted by the Albanians who, with the help of two Russian bishops from Yugoslavia, obtained the consecration of four bishops who formed their own Synod in 1929. The self-proclaimed autocephalous Church was then officially recognised by the Albanian State as one of its three national religious entities. Placed in front of this accomplished fact, the Ecumenical Patriarchate gave its benediction (εὐλογία) for the autocephaly of the Church of Albania a few years later, in 1937, but imposed its canonical conditions for that. After the formation of Czechoslovakia as an independent state, the Church of Czechoslovakia was proclaimed autonomous by the Ecumenical Patriarchate in 1923, but in parallel, some parishes depended from the Church of Serbia. One of the characteristic of the Orthodox churches in Czechoslovakia was the usage of the Czech vernacular language in worship. After the Second World War, Czechoslovakia was liberated from the German occupation in May 1945, and subsequently to the access of the communists to the government in 1946, came into close contacts with the USSR and found herself behind the iron curtain. The different existing Orthodox groups in Czechoslovakia, which had definitely a particular national flavour, asked at that time to be received into the jurisdiction of the Church of Russia. They finally were integrated into an autonomous exarchate of the Church of Russia in 1946. In 1948, the communist party took the power and the Church became then completely controlled in a very strict way by the communist regime. The Church of Russia decided at that time to proclaim the autocephaly of the Church of Czechoslovakia in 1951, a canonical act which was not recognised by the Ecumenical Patriarchate and other local Churches. After the Prague Spring (1968) and the dissolution of the communist regime in 1989 which led to the establishment of two independent states: the Czech Republic and Slovakia, there was on the one hand a revival of uniatism, which had been suppressed during the communist regime, and on the other hand, links with Russia were not well perceived by the local population. This is the reason that brought the Church of Czechoslovakia to seek support from the Ecumenical Patriarchate, which about half of a century later, officially proclaimed autocephaly of the Church of the Czech Lands and Slovakia in 1998. Besides the proclamation of the autocephaly of these three new Churches that have been recognised by all the local autocephalous Orthodox Churches, there has been in the 20th century the unilateral proclamation of the autocephaly of the so called “Orthodox Church in America” by the Church of Russia, in 1970, on the basis of her North America Russian Metropolia, parallel to the existence of other dioceses in that region of the Orthodox diaspora. If some among the local autocephalous Orthodox Churches have recognised this “autocephaly”, most of them cannot accept it, because of the ecclesial problem of co-territoriality in the Orthodox diaspora. Thus, one can see that the new situation in the Orthodox Church created by geopolitical changes in Eastern Europe in the 20th century raised the issue of autocephaly and the way of its proclamation. For this reason, this issue was identified by the First Pan-Orthodox Conference of Rhodes of 1961 as one of the question that ought to be resolved by the Holy and Great Council of the Orthodox Church that was planed since 1902. Thus, the theme of autocephaly and the way of its proclamation appeared as one of the ten topics of the agenda of the Holy and Great Council approved by the first Pre-Conciliar Pan-Orthodox Conference in 1976. A great work has been done on this topic by the Secretariat for the Preparation of the Holy and Great Council, the Inter-Orthodox Preparatory Commissions and the Pan-Orthodox Pre-Conciliar Conferences in Chambésy between 1993 and 2009. In his report for the Inter-Orthodox Preparatory Commission of 1993 presenting the different contributions that have been sent by the different local autocephalous Orthodox Churches on that topic to the Secretariat for the Preparation of the Holy and Great Council prior to the meeting if the Commission, Metropolitan Damaskinos Papandreou stressed that although there was a convergence between all the local Orthodox Churches on the concept of autocephaly and on the necessity of a pan-orthodox consensus for the proclamation of autocephaly, there was a clear divergence on the way to proclaim it, and especially on who initiates the procedure and who proclaims the tomos of autocephaly. On the one hand, some Churches (such as the Ecumenical Patriarchate, the Patriarchate of Alexandria, the Patriarchate of Jerusalem and the Church of Greece) stressed that the Ecumenical Councils or the Synod “endemousa” of the Ecumenical Patriarchate in the past and the Holy and Great Council in the present conditions were enabled to proclaim autocephaly. For this reason, in their perception, the Ecumenical Patriarchate was responsible to initiate the process of granting autocephaly to any new Church by searching for a pan-orthodox consensus a priori on that issue and then proclaiming her tomos of autocephaly on behalf of all. On the other hand, other Churches (such as the Churches of Russia, Romania, Bulgaria and Poland) stressed that each autocephalous Church had the privilege to grant autocephaly for one part of her own canonical territory, and that the pan-orthodox consensus on the recognition of this autocephaly ought to be reached only after the proclamation of autocephaly as a kind of ratification (a posteriori). A major consensus document on “Autocephaly and the way of its proclamation” was adopted by the Inter-Orthodox Preparatory Commission of 1993. This document, which underlines the “perichoresis between locality and ecumenicity” that exists in the institution of autocephaly, presupposes that the initiative for proclaiming autocephaly should be taken indispensably by the “Mother Church”. The Mother Church, having received a request from one region of her canonical territory, should examine it at her Holy Synod, and then, if the request has been approved on “ecclesiological, canonical and pastoral conditions”, sends the request to the Ecumenical Patriarchate whose responsibility is to reach a pan-orthodox consensus on the it. When the pan-orthodox consensus has been reached, the Ecumenical Patriarchate then proclaims officially the autocephaly of that region by signing a tomos of autocephaly, “which it is desirable that it be co-signed by the Primates of the autocephalous Churches, but in any case, by the Primate of the Mother Church”. This later phrase was a proposal made by the Church of Russia. Then, the newly proclaimed autocephalous Church is integrated in communion of the autocephalous Churches and is being commemorated in the diptychs. Although this document was approved by the Inter-Orthodox Preparatory Commission in 1993, its paragraph “3c” concerning the signature and the proclamation of the tomos of autocephaly was sent for further examination to the next Inter-Orthodox Commission, which took place in 2009. The Inter-Orthodox Preparatory Commission of 2009 amended this paragraph by stating that the tomos of autocephaly ought to be signed by the Ecumenical Patriarch and all the Primates of the local autocephalous Orthodox Churches. The issue of the signature of tomos of autocephaly was raised once again by Inter-Orthodox Preparatory Commission of 2011, in preparation for the Fourth Pan-Orthodox Pre-Conciliar Conference that ought to approve the final text to be presented at the Holy and Great Council. At the meeting Inter-Orthodox Preparatory Commission of 2011, a disagreement appeared concerning the way the Ecumenical Patriarch and the Primates of the local autocephalous Orthodox Churches ought to sign the tomos. The delegates of the Church of Russia even raised the issue of even reviewing the contents of the tomos itself. One proposal was that the Ecumenical Patriarch signs the tomos by adding the word “declares” (ἀποφαίνεται) after his signature, as the other Primates of the local autocephalous Orthodox Churches sign the tomos by adding the word “co-declares” (συναποφαίνεται) after their signature. A second proposal was that there would be no additions after the signatures of the Primates. A third proposal was that all the signatures would be followed by the word “declares” (ἀποφαίνεται), thus showing the equal consideration of all the Primates. A fourth proposal was that only the Ecumenical Patriarch would add after his signature the formulation “declares (ἀποφαίνεται) with all the Primates of the Most Holy Orthodox Churches”. Unfortunately, no consensus was reached due to a strong objection of the Church of Russia. Since there was no consensus on that matter at that meeting, the document could not be sent for approval to the Fourth Pan-Orthodox Pre-Conciliar Conference according to the by-laws of the Pre-Conciliar Conferences that presupposed that decisions be taken unanimously. Consequently, the document was never discussed since then, and the topic of autocephaly and the way of its proclamation was deleted from the agenda of the Holy and Great Council by the Synaxis of the Primates of the local autocephalous Orthodox Churches of 2016. Although it is a pity that no consensus could have been reached on the procedure of signature of the tomos of autocephaly, while consensus was reach for the rest of the document dealing with the way to proclaim autocephaly, it is interesting to note that this proposed document actually neither discussed nor clarified the actual reasons for proclaiming (or restoring) autocephaly. Furthermore, the document presupposes that the “Mother Church” of the region requesting autocephaly should examine the “ecclesiological, canonical and pastoral conditions” for proclaiming it. These expressions can be quite ambiguous. Indeed, if we take the case of the autocephaly of the Church of Poland or the one of the Church of Czechoslovakia, we see that there was a dispute in history whether to consider the Ecumenical Patriarchate or the Church of Russia as the “Mother Church” of these particular regions. Besides that, in looking at the historical reasons of the proclamation of the new autocephalies of the 20th century, one can clearly see that the reasons were rather geo-political (independence of a state, national consciousness, national language) than ecclesiological, canonical and pastoral. In that case, what would be the objective “ecclesiological, canonical and pastoral conditions” to be examined by a “Mother Church” which sees a region of her canonical territory requesting (or even auto-proclaiming) its independence? The major reason for the autocephaly of the Church of Poland was to gain an independence from the Church of Russia. The major reason behind the autocephaly of the Church of Albania was a certain independence from the Ecumenical Patriarchate. This explains why the Church of Russia had strong reservations in accepting the autocephalous status of the Church of Poland just as, in a similar way, the Ecumenical Patriarchate had reluctance to proclaim the autocephaly of the Church of Albania. Furthermore, would such a document help the Orthodox Church today to solve the ecclesial problems of the 21st century, such as the contemporary ecclesial crisis in Ukraine, in the former Yugoslav Republic of Macedonia or in Montenegro? For instance, although the Ecumenical Patriarchate is considered to be the “Mother Church” of the Church of Ukraine, the Church of Russia claims to have full canonical jurisdiction over Ukraine since the concession of the Metropolis of Kiev by the Ecumenical Patriarchate to the Church of Russia in 1686, and therefore, would never agree to be cut off of her historical roots by the proclamation of the autocephaly of the Church of Kiev. Thus, besides the problem of who should be considered as the “Mother Church” to initiate the process of proclaiming autocephaly, one could easily understand that to obtain a pan-orthodox consensus for the proclamation of autocephaly of the Church of Ukraine would be much more difficult than obtaining a pan-orthodox consensus over a document on autocephaly and the way of its proclamation! Therefore, if we look at the present day situation of the Orthodox Church in an objective and critical way, one can easily come to the conclusion that another Holy and Great Council of the Orthodox Church is definitely needed not only to approve the document on “Autocephaly and the way of its proclamation”, but also to clarify and define the specific reasons to proclaim or restore autocephaly, as well as to confirm in a conciliar way the autocephalies proclaimed in the 20th century and to resolve the on-going ecclesiastical crisis in Ukraine, in the former Yugoslav Republic of Macedonia or in Montenegro. Although the issue of autocephaly might seem to be an insolent question, one must remember that no solution can be found without a reference to the established canonical tradition of the Orthodox Church throughout two millennia and taking into consideration the specific role and the canonical prerogatives of the Ecumenical Patriarchate.